This mid back office chair, from Boss Office Products, is available in your choice of brown or black LeatherPlus upholstery. LeatherPlus is a urethane infused leather that is soft to the touch yet extremely durable. 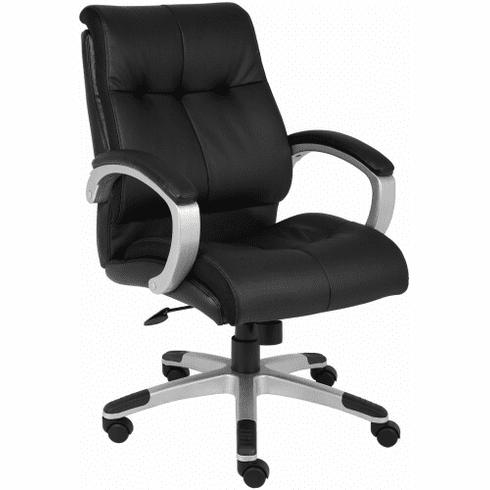 Other features of this mid back office chair include thick, double padded seat and backrest cushions, ventilated mesh side panels on both the seat and backrest, built in lumbar support, pneumatic seat height adjustment, 360 degree swivel, tilt with adjustable tilt tension, upright tilt lock, leather padded loop arms, pewter or silver frame accents and a heavy duty five star base with dual wheel carpet casters. This chair meets or exceeds ANSI/BIFMA standards. Dimensions: Seat Size: 19.5"W x 20.5"D. Seat Height Adjustment: 18" - 21"H. Overall: 32"W x 27"D x 38.5"-41"H . Six year limited warranty from Boss. This chair normally ships within 2-3 business days from either our CA or GA warehouse.